On Sunday, I motored up to Petaluma to be on This Week in Tech, or TWiT, at its new offices. 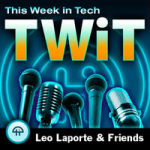 Hosted by Leo Laporte, it’s a roundtable on the news of the week in the digital sector. The other panelists included GigaOm’s Om Malik, CNET’s Rafe Needleman and Revision3’s Patrick Norton, talking about everything from the 30th anniversary of the IBM PC to electronic tattoos to the patent issues foiling Google (who knew?) to delicious cupcakes not eaten by Om.